I use this roving on a regular basis, it is what I used when I learned how to spin. I also use it when teaching beginners, as it has a longer staple length (about 4, 4 1/2") and drafts well. Domestic 56s Wool Top, 29.5 micron. The wool is collected from Fleece State area of U.S. wool production, predominantly black face meat sheep. The area is all the states east of the Mississippi and any state west of it that is not split by the Continental Divide. The soil generally makes it difficult to get the whitest fiber. I have also created a beginner spinning tutorial to help get you started https://youtu.be/Vy3fiXDmQt0. Quick shipping and gorgeous wool, Thank you! It can be drawn softly and smoothly. It's a really nice, wooly fiber. It will be a fun one to experiment with. 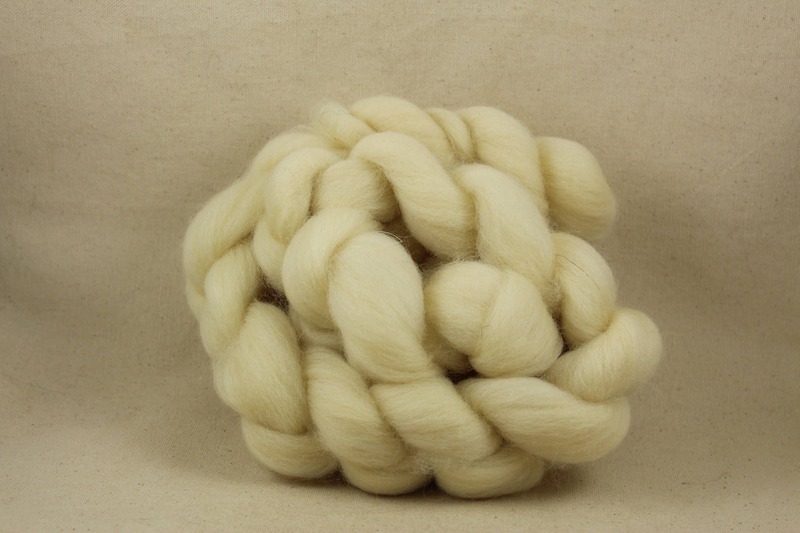 It is very easy to spin ♪ It is soft and moderate elasticity, I love cream colored wool! Thank you very much! This fiber is excellent for a beginner. It's soft and long stapled. This was my first fiber on a drop spindle, and I found it very helpful and enjoyable.